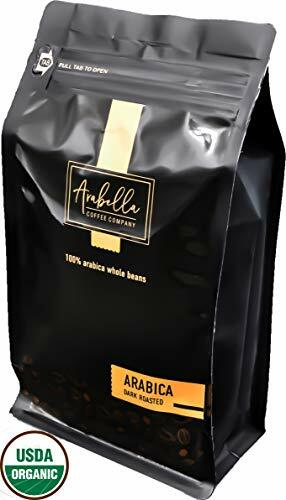 Arabella Coffee Co,Whole Bean Coffee, USDA Certified Organic Dark Roast Coffee Beans. Organic Dark Roast Whole Bean Coffee If you’re looking to start your morning with an enticing and exotic cup of coffee, Arabell Coffee Co USDA Certified Organic whole bean coffee will hit all the right notes. This dark roast, bold single origin organic Sumatran whole bean coffee brings together flavors of bell pepper, cedar, and a lemony acidity that’ll delight any coffee drinker. With a full body that’s ripe with Sumatra’s South Asian spice and pronounced roasted notes, but not overpowering, this is an invigorating cup of coffee. Sustainable, Responsible Brew Made with 100% Arabica, USDA Certified Organic coffee beans and recyclable materials, this organic dark roast whole bean coffee is kosher, and has no additives, preservatives or artificial ingredients. The coffee beans are roasted fresh in Chicago, USA, and are suitable for use in any coffee machine including Aeropress, pour over, drip machine, espresso maker, and moka pot. Arabella Coffee Co Arabella Coffee Co offers a 100% recyclable single serve cup and whole bean coffee solution that bridges the gap between quality and affordability. We give you premium quality coffee, with the convenience and price that matches or beats any other coffee brands on the market. We make coffee that is good to drink, good for the planet, and good for your wallet.